The ACLU in several states is requesting that Greyhound stop allowing the border patrol to board their buses. The U.S. Customs and Border patrol, pointing to federal law, says it has the right to board and conduct warrantless searches in any vehicle within a hundred miles of the U.S. border. Given Vermont's small size and its northern border with Canada, that means that a significant portion of Vermont falls within that zone. The ACLU of Vermont has joined the chapters of several states asking Greyhound to stop allowing agents to board its buses and ask passengers questions about their citizenship. ACLU of Vermont Executive Director James Lyall joined Vermont Edition to discuss the issue. The ACLU of Vermont's request to Greyhound came in response to a U.S. Customs and Border Patrol raid of a Greyhound bus in White River Junction last year. The ACLU of Vermont argues such searches are unconstitutional, citing the Fourth Amendment right against unreasonable searches and seizures. However, CBP insists these searches are legal, pointing to federal law that allows border agents to perform searches without a warrant on vehicles within a 100 mile radius of a U.S. border. James Lyall, Executive Director of the ACLU of Vermont, says this is an incorrect interpretation of the law. "Border patrol claims of broad jurisdiction with 100 miles of the border are not absolute-- they're far more limited than the agency ever says publicly. The Supreme Court decades ago has interpreted those regulations-- statues and regulations-- to limit what border patrol can do within 100 miles of the border." Lyall emphasizes that border patrol agents must establish reasonable suspicion of an immigration violation prior to searching a vehicle. The ACLU has previously gone after CBP regarding alleged civil rights violations related to the 100 mile border zone rule. Now they are taking a different approach, asking business like Greyhound to assist them in protecting individuals from unlawful searches. In response to the ACLU of Vermont's request, Greyhound stated that they allow these CBP searches to occur because they are obligated to comply with the law. However, Lyall says Greyhound has the legal grounds to refuse such searches. "We are also calling on private businesses including the Greyhound Bus Company and other carriers to not facilitate civil rights violations... [Department of Homeland Security] regulations say that agents may not enter businesses unless they have a warrant or the consent of the owner/operator." The ACLU of Vermont is urging businesses like Greyhound to utilize their right to refuse warrantless searches of their vehicles. "They're making a choice just as we are all making a choice... what kind of country are we going to live in? Are we going to live in one where we are free to go about our business or one where at any moment we could be stopped and interrogated by armed federal agents? And that's a choice that Greyhound and other carriers are being asked to make." Broadcast live on Tuesday, March 27, 2018 at noon; rebroadcast at 7 p.m. 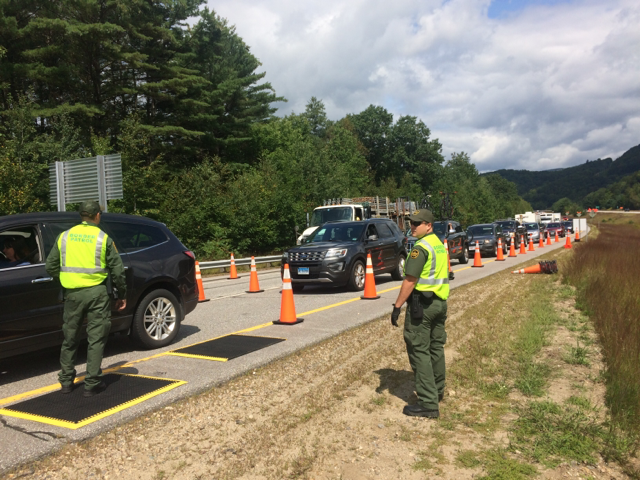 The ACLU of New Hampshire says the U.S. Border Patrol checkpoints on Interstate 93 this summer staged far inland from the Canadian border violated the state’s Constitution. A Franklin County, Vermont sheriff's officer called for the U.S. Border Patrol after he pulled over two Mexican farmworkers for a traffic violation last August.